We at the TRASTRA team were in a long search for a bank to open operational and current accounts – but like many other crypto startups, we found we encountered a lot of obstacles on our way. Thus…. this article. We have gathered a lot of practical statistics upon this issue to tell you about. Our company is located in Europe, we were trying to find a bank in Europe and near European countries. Not the easiest country to open a bank account for crypto business. A greater part of the big banks is not ready to deal with “unregulated” currencies. We found sources, that name two banks in the Netherlands that are open to crypto businesses, they are Bunq and ING. Germany was considered the country with considerable opportunities for crypto startups. VPE Bank became the first German bank to launch crypto trading for institutional investors. Fidor Bank also allows cryptocurrency trading activities. However, recently many banks toughen the rules on cryptocurrencies, for instance, Commerzbank, renewed company policy to stop dealing with crypto related companies. Estonia has one of the most digitally advanced governments in the world, but contrary to it, Estonian banks are not the best place to open a bank account for crypto business. The LHV Bank, for example, is not against crypto companies at all, but still doesn’t support ICO’s and cryptocurrency companies in an early stage as part of their risk policy. In case they accept such companies, there is another price list, and the company must have the VAT and some additional security steps. Despite all the efforts of France to create a legal framework for cryptocurrencies, it is still very difficult to open a bank account for a crypto company here. France’s Central Bank wants to keep out banks and financial institutions from dealing with crypto business. One of the hardest places to open a bank account for crypto related business. Traditional tactics, like scheduling a personal appointment for all the shareholders regardless of them not being present in UK should be followed here, get ready to book a flight when they give you an appointment, no flexibility observed. Malta is presented in the media as one of the best places to open a bank account for crypto business. The country has recently enforced some specific rules regarding cryptocurrencies. They include the establishment of the Malta Digital Innovation Authority. As the best example for you: Binance opened a bank account in Malta when it relocated its headquarters there. What our own research has shown? No answer and total ignorance. 83% of banks totally ignored our emails and didn’t give us any answer. “Would never open an account for crypto-related company”. 7% of banks gave us such an answer, and it upsets really. Answer as a matter of form. 8% of banks gave us an answer with details of opening an account but declined our application later because of different reasons. Visited our website, saw the word “bitcoin”, said us “no”. Wanted us to be present in their country with a branch of a company. Didn’t want to waste their time on a crypto company because of the great influx of other companies (after the closing of a big quantity of Baltic banks, and strictness of Cyprus banks). After some calls, some of the banks decided not to waste their time, because we demanded a lot of meetings and asked too many questions. Some of them didn’t want to work with “non-European” beneficiaries, CEO. 4. Signed, sealed and delivered. Finally, we have found 3 banks that were ready to help us. We chose one of them to test their service. Whilst I acknowledge the account may only be required for normal corporate expenses the crypto focus of Trastra places you outside of our current appetite so I am afraid we are not able to help you. Unfortunately, our Bank does not open current accounts to companies which business activity is related with cryptocurrencies. Yet we regret we have to inform you that due to business policy reasons we will not be in a position to meet your requirements. Our bank is presently not supporting businesses connected with online platforms. Thank you for your email. As a Dutch bank, our bank corresponds and services her products in Dutch. We will continue to answer your question in Dutch. Thank you for your interest for opening a corporate account with us. Please note that only non-resident companies having a business relationship with companies from the Republic of Serbia would be acceptable for the initiation of the account opening procedure. According to Bank’s policy, every individual company must submit a request for an account to be opened in its own name. Therefore, the Bank shall not accept requests submitted through the intermediary company, neither open account in the name of an intermediary who will use the account for execution of operations of its customers. Please note that our bank has a cautious policy related to non-resident account opening, requiring a detailed procedure to be undertaken (including especially customer identification and his ownership structure until the final beneficial owner), which includes submitting a set of notarized and translated documents. The physical presence of a company’s representative is required for the purpose of account opening in the name of a non-resident. Please also note that our bank’s policy related to opening accounts in the name companies coming from offshore countries is very restricted. Please be informed, that our bank doesn’t cooperate with the clients with this kind of business. We’re not interested in setting up business relations with any company dealing with cryptocurrencies. Thank you for your interest in our services, but we are not currently interested in entering into a contractual relationship with your company. Unfortunately, we are unable to assist you with your request, due to our Customer Acceptance Policy. Count of the country chart shows the number of countries and most of the decline cases with declines being higher with Countries having stringent political policies regarding direct FDI and FII investments in the banking sector. This showcases a tendency that the more liberal the country is, the more foreign direct investment and more foreign institutional investments are funded at the private level (in this case — Financial sector). The statistics indicate a rise in the Banks of the United Kingdom as being more strategically biased than other nations. KYC&AML policies of the company. The main problem that I personally met was related to the “tunnel thinking” of banks, most of them simply refuse any company that has something to do with cryptocurrencies. A lot of banks refuse to even talk or work with Crypto companies. Some banks, however, who have the technological advancement to discover the issue, have monopolistic high rates for opening up an account. A little bit of bureaucracy is also present, as a high set up fee is discussed in the conferences and etc. Crypto-friendly banks are present in smaller European jurisdictions, with Swiss banks being very costly, but crypto-friendly, whereas the more traditional and narrow-minded banks are present in the UK, it is the most friendly place to obtain a license but the hardest part to open up an account. A lot of banks also have a due diligence method to check the directors and ask very personal info for further negotiations relating to kind of “ Invasion of privacy” and “business ethics” which is a total disaster. Apart from that — banks have a very long timing and big forms which are sent to crypto companies. For me it personally was a hassle. They do not trust cryptocurrency. The most crucial reason is that banks are afraid of cryptocurrencies. All banks see crypto as money-laundering activity, fraud, scam, whether you are a trading company, exchange service, or doing an ICO. These reasons meant nothing to TRASTRA because we demanded bank account asap to conduct business activities. 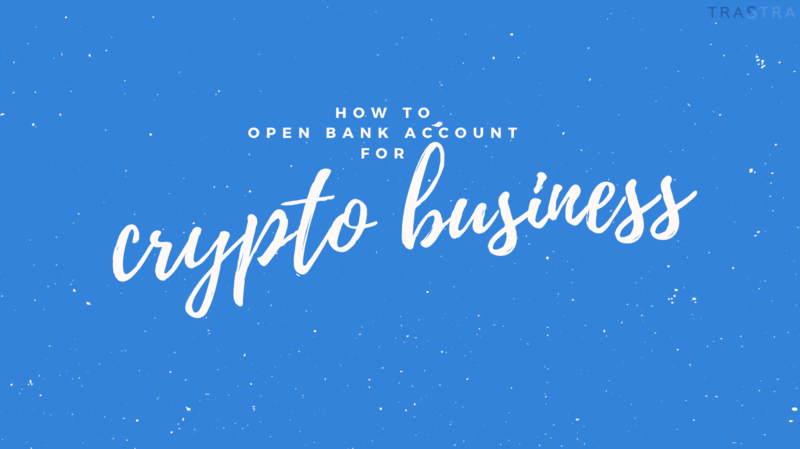 What should be done to make it easier for crypto-related business to open a bank account? First of all, it is turning off of an old bank bureaucracy style of communication, and turning on the customer-oriented approach. In a process of speaking with some of the banks, we were redirected at least 5 times to different personas, we had a phone calls in which we were put on hold for more than 40 minutes, we heard the “F” word several times. The second thing that should be done, to my mind, is reading and right research. The majority of banks that ignored or rejected us didn’t even read an information about TRASTRA company, they made their decisions just by visiting our site and seeing the word “Bitcoin”. The last thing here, but not the last thing at all, is the most crucial: banks should not be afraid of cryptocurrency users. However, here we have no power. But again, I would like to underline, that not all the banks have that gross service. We met good partners, not a bank, but a payment system*, with the reliable and friendly attitude to our crypto related business. *According to NDA we can not provide the company’s name.